This year, for the first time in Pennsylvania State University’s 162-year history, its estimated 4000 Jewish students will have kosher food options, thanks to the amazing Divine Providence that inspired one student to advocate for them. On one weekend, last year, Philadelphia native and industrial engineering student Aaron Goldberg—who was completing an internship in Pittsburgh during his junior year–came back to his college campus located in State College, Pennsylvania. At that time, he met a student who was considering attending Penn State. She was observant and told him that, although she may have wanted to go to Penn State, she decided to go elsewhere because the kosher food options at the university were limited. Subsequently, after Aaron attended a Pesach seder in Pittsburgh, his hosts observed and commented on the fact that he kept kosher for Pesach but not year round. Both incidents got Aaron to reflect not only on his own observance of kashrus, but that of his fellow and potential future Penn State students. These incidents spurred Aaron to be on a mission and his preliminary call to the dining manager at Penn State’s Beaver satellite campus confirmed that there were no kosher options at the university. He was advised to explore the possibility with Lisa Wandel, director of residential dining. Despite family members who doubted that his lone voice could make a difference, Aaron’s persistence had him spending a good part of his last year’s summer vacation, in Toronto, making several time-consuming and expensive international calls to the director. He was told that when he got to campus they could meet and discuss what could be done. After meeting with Aaron, Lisa Wandel realized that it was time for Penn State to explore a kosher dining option, especially since State College had no kosher restaurants and its Hillel program had no kosher dining option. Opportunities were being missed for its current student body and future students. Aaron next surveyed students, many of which he knew from Jewish organizations on campus, to confirm that there was interest; several of them told him they kept some form of kosher. The timing couldn’t have been better. The university was already in the process of renovating the Findlay Commons where they were putting in a space for allergy-free foods, such as gluten-free, peanut-free, and dairy-free. Adding kosher as an additional option would not be complicated and it would be cost-effective. 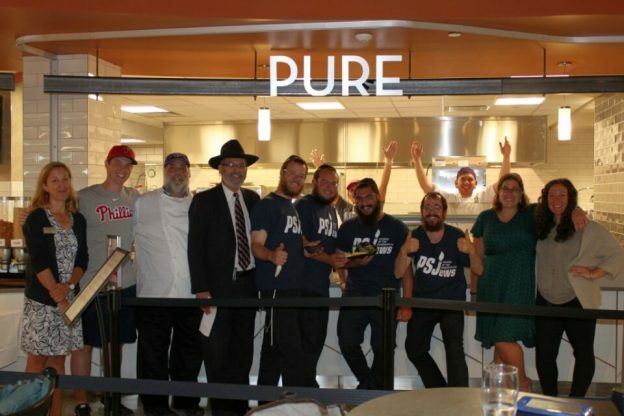 On August 22, Aaron’s persistence paid off when PURE, a separate, self-contained, allergy-free, kosher kitchen and dining station, under STAR-K Kosher Certification, opened for returning Penn State students. Additionally, Hillel, Aish, and Chabad representatives greeted the students during the grand opening. The dining facility is now open for Sunday brunch and dinner, and Monday through Thursday for dinner. Any student that has a meal plan can enjoy dishes like Thai green curry chicken stir fry with rice and roasted Tandoori turkey. STAR-K Rabbinic Administrator Rabbi Mayer Kurcfeld, who is responsible for the Penn State PURE account, congratulated Aaron, commenting, “Aaron, have you any idea what zechusim (merits) you have achieved by having all these students eating kosher and making blessings? More so, being that you are graduating this year, knowing that even after you leave, the kosher program will hopefully be continued for many years to come? I am envious of you.” Aaron was beaming! Based on Aaron’s track record, I wouldn’t doubt it!